Polymer applications range from biomedical devices and structures, packaging, or toys to automotive and industrial items. So far, biopolymers could replace commodity polymers in a variety of products, especially for biomedical applications or food packaging. 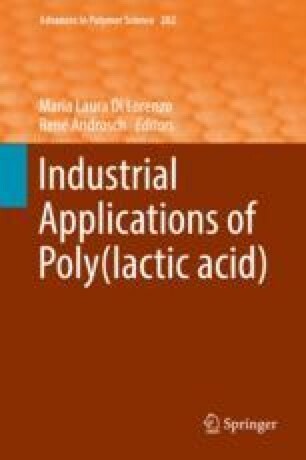 One of the most used and widely studied biopolymers is poly(lactic acid) (PLA). To generate new application fields and provide a broader application of PLA, research on processing behavior is still required. This chapter covers the processing relevant behavior of PLA and processing conditions for extrusion melt spinning, injection molding, and additive manufacturing. The processing-related behavior is compared to that of commodity polymers. The aim is to provide an overview of the state of the art and some recent new developments in this research field. The authors thanks the Institute of Textile Machinery and High Performance Material Technology (ITM) and the Technical University in Dresden (TUD) for cooperation and support, especially in the melt spinning process. Hahn J, Breier A, Brünig H, Heinrich G (2016) Mechanical adapted embroidered scaffolds based on polylactic acid melt spun multifilaments for ligament tissue engineering. Annual report of Leibniz-Institut für Polymerforschung Dresden e. V., Dresden. chapter: Biology-inspired interface and material design. pp. 42–44. http://www.ipfdd.de/en/publications/annual-reports/. Comment: The source is from the Leibniz-Institut für Polymerforschung Dresden e.V.